In 2010, when Canada ratified the United Nations Convention of the Rights of Persons with Disabilities, we made a commitment to ensure that all people can access the support they may require to exercise their legal capacity. Yet people who require support to participate in decisions that affect their lives can still find their capacity to do so questioned and their legal capacity removed. Someone else is then appointed to make decisions for them. Families often do this in order to protect their loved ones because there seems to be no other options. 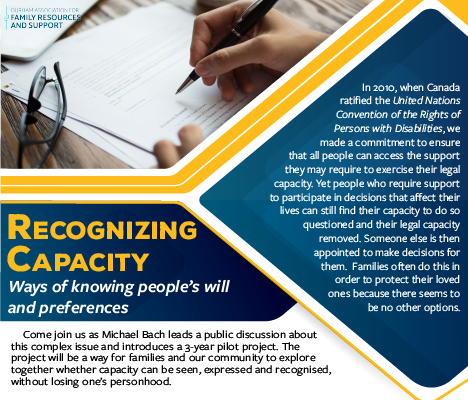 Come join us as Michael Bach leads a public discussion about this complex issue and introduces a 3-year pilot project. The project will be a way for families and our community to explore together whether capacity can be seen, expressed and recognised, without losing one’s personhood. See and share the flyer here! What would it take for someone to receive the right mix of supports and accommodations from others to make their exercise of legal capacity possible? How might we better respond, hear and uphold the voice of the person? What are the ways of knowing a loved one’s will and preferences, how can we listen deeply and support them to express their personhood? Michael Bach is the Managing Director of The Institute for Research and Development on Inclusion and Society and Adjunct Professor at Ryerson University Toronto.